Construction runs smoothly thanks to a little forethought and attention to detail during the design phase. 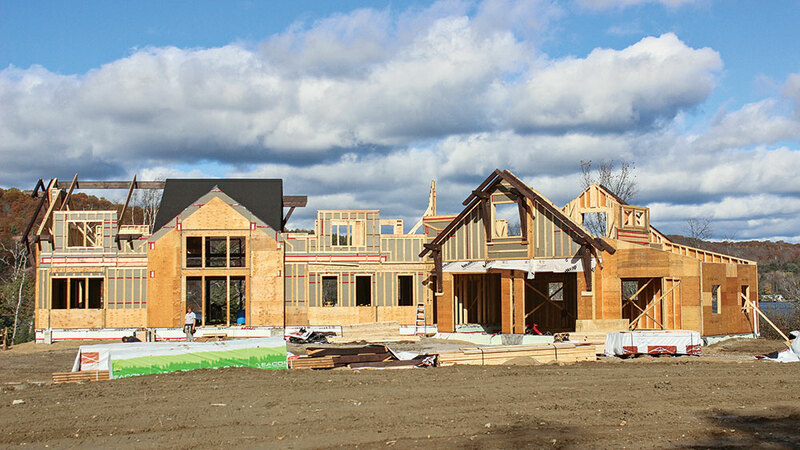 Ask any timber home company or contractor and they’ll tell you that when it comes to starting construction on your home, it’s all about timing. But when you’re building a custom home in the severe climate swings of Ontario, Canada, that timing is particularly crucial. Tim Lamb of Lake of Bays Custom Homes got to work prepping the site, digging the foundation and adding the footings and concrete before Jeff and his team could deliver the air-dried timbers for the frame. Again, the topic of timing proved important to the process. These renderings also dictated how the finished wall system would be prepared before construction. For example, plywood was incorporated on the wall panels around the front door to eventually accommodate exterior stone work. Other wall-system customizations included horizontal and vertical strapping to anchor the siding, and cuts and grooves to perfectly hold the exterior timbers. One thing the walls don’t include are standard structural insulated panel (SIP) construction. Instead, they’re made from a full layer of foam insulation before custom insulation is blown in to match the climate’s needs, adding to the system’s flexibility and customization. Because there’s no solid interior layer, the walls also come with a built-in wall cavity for plumbing and wiring to run easily. By creating a smart schedule and nailing down details during the initial design process, the build team ran into minimal hiccups during the construction phase, with the exception of one late-breaking request from the homeowner.